The following was written by my oldest brother, Edward Parham, known in our family circle as “Eddie Ray” since long before I was born. Eddie Ray, editor and publisher of The Parham Report and The Parham Review in Camden, wrote this tribute following the death of our mother, Clora Smith Parham, on March 4, 2015. It was a memorial not only to Mama but to Maud Crawford and her unresolved murder and to our grandmother, Essie Jones Smith. Among you readers there are doubtless some who know of my predilection for the mystery of Maud Crawford, and are accustomed to – perhaps even anticipate – my refreshing some aspect of her still-unsolved case in observance of the anniversary of her March 2, 1957 disappearance. Perhaps those few noticed that this year’s date passed without my customary entry. February had worn past Valentine’s Day with me mulling a couple of potential Maud projects. Either one would have had a hard time approaching my 2014 effort, a story based on a sit-down interview with Dorothy Williams. She’d been employed in the 1940s and ‘50s as a legal secretary in the Gaughan, McClellan & Gaughan law firm, and – even all these decades later – was able to provide tunneling insight into the Downtown office suite where Maud Crawford worked. But just as I was about to try telephoning a prospective interviewee or two, a call came into me instead, from my brother Rodney telling me our mother had had another stroke and was being hospitalized in Fordyce. By the next weekend, she had developed pneumonia and was dying. On the last evening I saw her alive, sitting in a chair beside her bed, a mirror over a sink reflecting our two faces in a single frame I’ll carry to my own grave – hers unrecognizably weary and in an induced sleep, gasping for every breath; mine in unwanted vigil – it came to me all of a sudden with a horrible dread that at first I wanted to blurt the awful realization out loud: it was March 2. My mother could die on the same date Maud Crawford vanished. I’m haunted enough by what remains unrevealed on Clifton Street across the way from what my mother’s extended family called the Big House. Her father – my Granddaddy – had just purchased the old Jack Newton place at Dallas and Greening and was renovating it at the time Maud went missing. That Spring, he and my grandmother moved into the Big House, and Mama and I spent several months while Dad finished out his hitch in the U. S. Air Force. Two years old, going on three, I’m sure I overheard a lot of worried talk about the uncertain fate of the woman who had lived in the imposing edifice across the corner from our screened-in back porch where the door had to be kept latched and pinned to keep me from getting out and roaming the neighborhood. I was notorious for getting loose and leading Grandmama on furious pursuits. She would recall for me in later years that when I’d strike out on tiny legs in the direction of the Crawford home, it was because I was fascinated by a “big white dog” that must have belonged over that way. This annum’s March 2 came and went with Mama still locked to life. As did March 3, which is significant in Maud Crawford lore for being the date she was discovered to be missing. Eleven days after this ordeal began, Mama breathed her last late in the afternoon of March 4, with Daddy alone in the room with her, everybody else in the family either already trapped by an approaching wintry storm or behind their doors for the evening to await its icy advance. We all woke up the next quiet morning to a beautiful bottom-side-of-the-quilt snowfall on the ground. So, no, there’s not the traditional Parham contribution to the Maud Crawford canon the first weekend of March 2015, and I’m left with a sad three-day association for however many more months of March I have left in my life. Each year they come to pass on the calendar, the 2nd, the 3rd and the 4th are sure to come in like the proverbial lion, a gauntlet of difficult memories. Understandably, many testaments to Mama have crossed my consciousness in the few days since her passing, some expressed by others, some which occurred to me while in the company of people at events attendant to her funeral. Here, I’ll limit myself to three. First, I remember that the late Ed Falwell, who for years operated the Western Auto store here, used to make it a point – whenever he came across me out in public during my early years reporting for the Camden News – to tell me what a good bookkeeper Clora Parham was. While Dad was serving overseas duty (minding a warehouse of hydrogen bombs on Okinawa during the Korean War), my grandparents relocated from up in the country to Camden so Mama could work keeping the books for Mr. Falwell at his B.F. Goodrich franchise Downtown near Madison and Washington streets. Mr. Falwell like to recall that Clora was smart, pretty and a stickler for balancing numbers. The Smiths of the tiny Jacinto community on Arkansas 9 North of Holly Springs were all of that bent – preoccupied with measured-up accounts – it seemed to me. They liked to say that each clan member in Granddaddy’s generation was either a (Missionary Baptist) preacher or a (public-school) teacher, but my own private joke with Mama was, that side of her family ought to spell their last name with a $ sign, as in $mith, not that any of them were especially wealthy, but because they had a high regard for the art of not spending any more money than necessary. Granddaddy himself always observed Depression rules when it came to dispensing cash. He preferred shopping at places where he could negotiate down the price. Granddaddy has been gone from us for 35 years, so I can’t ask him for the details of a mysterious out-of-town gathering of his brothers and sisters back in summery months of the late 1960s. I don’t even remember the town in which it took place, except that it was near the Ouachita River; so probably Arkadelphia or Malvern. The reason I remember it at all, I think, was because he took me along with the promise of as many hamburgers as I could eat for lunch. I said I could eat six (I was probably 14 or 15 years old), and he laughed and ordered six hamburgers. I ate them all and had to concentrate that afternoon not to give away how miserably stuffed I was. He had me sit outside a meeting room which he entered and shut the door behind him, although I was able to see Aunt Connetta and Aunt Myrtle and all his brothers seated around a table, all of them addressing him in a very formal manner. It was more like a board meeting than a family function, because they were together to discuss some matter of business. Afterward – I distinctly remember this because he made the observation as if it was something to be marveled at – he said that somebody in the room had solemnly remarked that any two of them would together be worth more than $1 million. There was the time after Granddaddy died, with the remnants of his extended family divided by a property dispute taken into Dallas County Circuit Court. It went to trial, and Grandmama had me drive her up to Fordyce for it. Straggling into the Courthouse after parking the car, I had the misfortune of encountering one of my grand-uncles at the bottom of a stairway leading to the second-floor courtroom. He grabbed my hand, shook it, and informed me that he loved me, but at that moment was so mad he wanted to punch me in the mouth. A cousin lawyering in this old case – and who is now a judge on the U.S. Eighth Circuit Court of Appeals – subsequently developed a deserved reputation in the Western District of Arkansas as a mediator of extraordinary skill. With the outcome of the Fordyce trial twisting unresolved during a recess, he announced his opinion that out of all the Smiths with whom he’d discussed the dispute, only one understood it. He hoped to get her on the witness stand to explain the particulars to the judge, in order to achieve a fair resolution. “Clora is the Voice of Reason in all of this,” he declared. But putting Mama on the stand was a tactic of last resort. All parties knew that her disorder, essential (also called benign, or familial) tremor, would prevent her from testifying to any useful effect. And that’s exactly what happened. She tried. She sat in the chair, with all those Smiths looking on. She struggled. But all she managed to do was demonstrate that it is impossible to convey complex statements when the voicing of word upon word is equivalent to arranging blocks of granite. I have the same problem, and can tell you flatly that it is a debilitating condition. Haven’t lifted a drinking glass in years. Don’t bother trying to dine in public. Can’t hold a newspaper to read it. Can’t tie shoelaces. Can’t take notes. If you’ve heard me speak, you know I sound like I’m either drunk or have had a stroke. And on, and on, and on. It’s a good thing you can’t see me pecking out these letters. With a computer keyboard, the going is somewhere between laborious and torturous. Without the marvel of word-processing, the Report wouldn’t exist. I’m blessed with a wife who has good use of her hands to do a lot of what I was able to do before my ET worsened, even stepping forward to represent us when the two of us venture out for business. As part of her burial service at Temperance Hill Cemetery outside Fordyce, members of the Chicot Trace chapter of the Daughters of the Revolution conducted a ceremony to call attention to the fact that Mama was descended from a North Carolinian who defied her husband and aided American forces in the war against the British. I appreciated that one of the women interjected her personal anecdote about how Mama once confided to her how frustrating it was to be without the power of vocalization – that and having to listen to people able to command others’ attention while speaking as an authority on a given subject, when she knew more about it than they did. There’s a third testament to Mama that I want to get to, but not just yet. On the day after we buried Mama, I paid $102 to the Camden News to publish her obituary. I’m aggravated that only half of it made it into print. My baby sister Sandra went ahead and wrote this tribute while sitting up with Mama after she was placed in hospice care. It’s an inspired obituary. I’m disappointed because the passages which elevate it didn’t make the CN cut. I’ve told my sister (in jest) that it’s obviously well-written because so many seem to think I wrote it. I never intended to publish it here, but because it didn’t reach readers through the Camden daily, and because I think it ought to be read in Camden – even if here I’m reaching only a small fraction of CN’s readership – I’m determined to line it up and try it again, the part which got left off, anyway. Mama’s last days numbered 11, but she had already begun to leave us. Three years ago, while on a camping trip in North Arkansas, she sustained a small stroke which left her noticeably frailer and less focused. It was as if she’d had a bout of flu and couldn’t fully recover from it, leaving her a semi-invalid prone to long afternoon naps. She couldn’t cook like she had before, couldn’t dispatch flurries of messages to us via Facebook. She could telephone-call, but she couldn’t make herself very well understood. I’d circuit through Fordyce about once a week, stopping in and expecting supper whether it was something she’d worked to prepare herself or me running back out for hamburgers or pizza. It eventually occurred to me that I ought to be doing this other thing, so last September – on Dad’s birthday, as a special activity for the occasion – after we’d finished eating, I bustled in between them with my little digital audio recorder and set up my laptop computer for on-the-go transcription, to type in the occasional keyword as they talked. Whatever else she couldn’t do, Mama could very well think, and — sitting comfortably in her chair with only me for an audience — she could speak out and with sufficient detail to address the questions I was about to put to her and Dad. Ed and Clora Parham’s family timeline was what I intended to start putting together that night. Old reporter that I am, I wasn’t going to harvest information in linear fashion from very beginning to end. This was going to require many sittings, and my subjects might take longer to adequately warm up to the task than they knew. You don’t begin a carving with a deep cut. You shave. You test your material. What I wanted to jump off into was the first family car, then move on to the second, and the third, waiting for unexpected side-stories to come in off the margins of their recollections. It so happened that our first car — which I remember quite distinctly — was a used 1954 Chevrolet Bel Air. Light Blue. Had four doors and a manual transmission. Dad bought it in 1956 for $900 cash from the old Lindsey Brothers dealership here. On we went like that for an hour-and-a-half, tying cars and trucks to houses where they lived as Dad — a retired school administrator — took jobs all across South Arkansas, up until the present day, where we stopped. Mama was “chuffed,” as they’d put it in England. This sort of enterprise was exhilarating for her, obviously, and that there was more to come gave her something to look forward to doing. She couldn’t quilt anymore, or continue her genealogical research, but she’d just proven she could still put down her personal history. Logically, the next direction would have been to go backward in time using our old addresses in places like Camden, Jacinto, Princeton and Temperance Hill as a bread-crumb trail. My childhood recollections of those houses and the reasons why we lived in them are too disjointed for me to get them lined up on my own. I left Fordyce that night looking forward to having Mama and Dad put them – and my own early days, and theirs as well – in proper order. Hunting season opened up, and the two of them relocated to the Deer Camp at Mama’s “Old Place” at Jacinto so that they weren’t home as I made my weekly passages through Fordyce. Then came the holiday season, which I exited in arrears on my publication schedule for reasons I don’t now recall. By the time I resumed making my regular stops in Fordyce, January was rolling away into February. The second week I showed up, Mama was visibly displeased that I hadn’t brought my recorder. I explained that I was still running behind and couldn’t stay long enough for the session we’d by then put off since the first one on September 17. The next week, I had to tell her when she asked that I’d just forgotten it; I was still trying to catch up on my papers. That was the night she dispatched me to Fordyce’s Sonic Drive-In to fetch us all hamburgers and cheeseburgers. When I returned with them, she had me bring hers to where she sat in her chair, complaining that she was too cold to go eat with me at the kitchen table. Before I left to come back home to Camden, I assured her that I was sure I was ready to pick up again with our timeline work. “I’ll bring my recorder next week,” I said. She turned her lip crooked, a look of momentary resignation. At about the same time the following evening, as Dad told me later, he heard a tumble in the kitchen and investigated to find Mama lying on the floor. She hadn’t hurt herself — no broken bones, not even bruising — but her left side was limp. Although I got up there in less than an hour after being called, I never talked to her again. Nothing was left except to endure those 11 final days, the patches spent sitting by her bed with our faces turned together on that singular mirror frame, me watching her breathe and not knowing if each one coming would be her last. Realizing that one of those days was the Maud Crawford anniversary crept upon me in an excruciatingly long pause as I waited to see if Mama would inhale again. That I wouldn’t have those history talks with Mama laid down a layer of regret each time the folds of her hospital blanket rose and fell. And that’s besides the grief of losing my Mama. I’m not going to go into that. March 2. March 3. March 4. Those are now dates for me to ponder what slipped away from me because I didn’t realize Mama’s life was near at end, and what similarly eluded Camden because all those who could have acted – and could still do so – never resolved the tragedy which befell Maud Crawford. If you’ve read this far, then you should be infused with the understanding that what remains of Clora Parham on this Earth – because she was much loved by us – lies in eternal rest at Temperance Hill. Having just buried my Mama, it serves to aggrieve me all the more that Camden won’t do the same for Maud. Her final resting place at Greenwood Cemetery – next to where her husband Clyde lies – remains empty. Empty of love this community owed her, but never gave. I mentioned a third testament to Mama, that came to mind as we were preparing our farewells. This is the nicest of all, I think. It has to do with something she and her own mother – my beloved Grandmama, Essie – did when Mama was a 10-year-old girl, because Mama’s older sisters had both moved on to college and – so it seemed to Mama – left her and Grandmama all alone at what we’ve come to call the Old Place at Jacinto. There’s no Old Place there, any more. Granddaddy had the house moved to Sparkman and renovated. When it burned in 1966, he and Grandmama moved to Camden for good, building the house here on Columbia Avenue where I live today. The outbuildings were still there at the Old Place when I was a young boy. Across the road, barns later served as home to what became the Jones Deer Camp. Grandmama’s nephews prevailed on their Uncle Ray to let them hunt from there, a mile up a high and wooded hill from Arkansas 9. I never knew until Mama’s cabin was built a couple of years ago just how high that ground is. What I thought was a headlight shining up at us late one Winter’s day through the pines turned out to be the sun; if you could look out West from the Old Place, you’d be looking down at sunsets. Right at this moment, I’m wishing I could ask Mama if she could look out from the Old Place when she was a little girl, and if she could, did she look down at the dying light of those days? Her mother was good-hearted. Mama wrote of her in the Jones family cookbook that Grandmama “could make cornbread by the time she was seven years old,” and “she never outgrew that need to cook” after helping her mother feed her nine brothers and sisters. That day young Clora pined around the Old Place for her big sisters, food wouldn’t do. Her mother hit on another angle to keep her occupied, something they could do together. Bulbs of jonquils “clump up” if left to grow in one spot season after season. If you make the effort to dig them up and space them out, you’ll come to have a bumper wave of yellow blooms come early Spring. Clora and Essie didn’t just replant the bulbs they uncovered. Grandmama had somehow been inspired to spike the bulbs in a pattern. Even though her daughter couldn’t see it right away, she understood why it would be worth the effort. Just as Grandmama intended — and she was said to be pretty proud of how the pattern turned out — when springtime came and the daffodils blossomed, the name “CLORA” burst forth in letters of gold. Even after Granddaddy and Grandmama struck housekeeping at Jacinto and came to Camden so Mama could work at the Goodrich store, those daffodils kept spelling out her name year after year, a landmark on the side of the road for those who still passed back and forth in that old community. My own eyes have seen it. I also saw over the intervening seasons how the letters blurred and became indistinct. I remember it being remarked on Spring that we could still make out the “C” and the “O,” but not the rest of it. 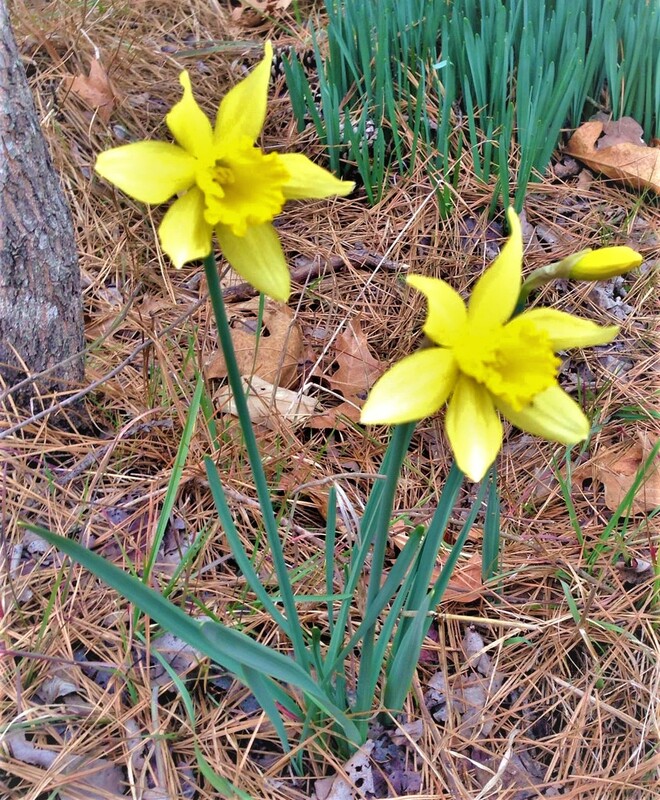 At some point, with so many people of that age gone on, the Clora daffodils passed out of annual conversation. And then I thought of those daffodils Grandmama and Mama planted up there at the Old Place on the side of a gravel road off the side of a highway forking away from U.S. 79 North out of Camden, calling out CLORA all those years ago. Three days after the burial, making a solitary walk in a mist of evening rain, I visited the side of Mama’s clay-mud grave out at Temperance Hill, a lonely place for a lonely son, aching and crying because I couldn’t talk to her again. Finally sloshed out through the puddle at the gate and got back in my car to drive across the back road to Jacinto. I was sullenly curious to know if any of those jonquils were left, or if they’d been overrun by the pine which have grown up over the Old Place. Didn’t know what to expect, wondering if maybe one or two green clusters had survived in the brush. Then I rounded a curve and there spread out by the hundreds – glints of Spring yellow in the hush of near-darkness – were Mama’s flowers. Hundreds! They live! Their message to the passing world has changed, but they still speak to those of us who know what they say, because they still bloom.